The UK government- more interested in funding 'rebels' in Syria and protecting bankers' bonuses than in flood defences at home. My new column for RT.com OpEdge. The terrible impact that the ongoing floods have had over large parts of Britain - and the government response to the disaster - tells us much about the political system we now live under and in whose interests our government acts. 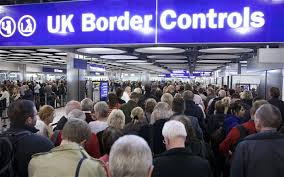 What’s going on – why has EU immigration become such a big issue? To answer the question, we need to look back at the political and economic changes that have occurred over the past 30 years. If you're a winter sports fan I hope you're enjoying the great action from Sochi in Russia. If you missed the wonderful opening ceremony last Friday, you can watch the RT coverage of it again, above. The programme includes an interview with me starting at around 23 minutes. While here is my piece for RT.com on the history of the Winter Olympics. My new piece on the late, great Pete Seeger, from The American Conservative. The Penguin Encyclopedia of Popular Music described the politics of Pete Seeger, the folk-singer, songwriter, and antiwar activist who died last week at the age of 94, as "naïve but honest." They were certainly honest—not even Seeger’s worst enemies would dispute that—but what was naïve about Seeger’s socialist conservatism? Why is the West supporting neo-Nazis and racists in Ukraine? You can watch me discussing Ukraine with George Galloway and Gayatri on Sputnik on RT with the programme showing at 12.30pm, 4.30pm, 6.30pm and 10.30pm on Channel 85 in the UK (Freeview) today (Saturday 1st February). If you are unable to watch, the programme will be posted later to the Sputnik page, here. UPDATE: If you missed the programme, you can watch it here.